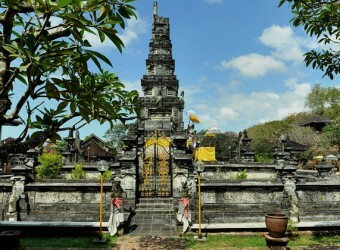 Jagad Natha Temple is located in the middle of Denpasar, next to the Bali Museum. In the center of precincts, there is the tower of universe (Padmasana), and Sang Hyang Widhi, the highest God in Bali Hinduism, is worshipped there. There is the moat around the tower, and the detailed wall painting modeled by Ramayana on the wall. It is close to Bali Museum so I went there on foot. This temple is not a big temple but it is also a tourist spot. Many local people visit this temple. I heard that many Hindu people pray at this temple on full moon night.